This past Monday, Nathan's future mom-in-law, Sheri, wrote this post, which I absolutely loved. And since Steve and I are going shopping for my own dress this Friday, I've got my bargain-huntin' shoes on! Also, Jon Acuff,a funny guy who I love to read, posts a more serious post every Wednesday; I thought this one was especially good. It's called, "The Problem With Punctuation." And lastly, I didn't find this picture soon enough to include it in yesterday's post about Nathan "trying on manhood" but I couldn't resist posting it today. Is this kid cute, or what? 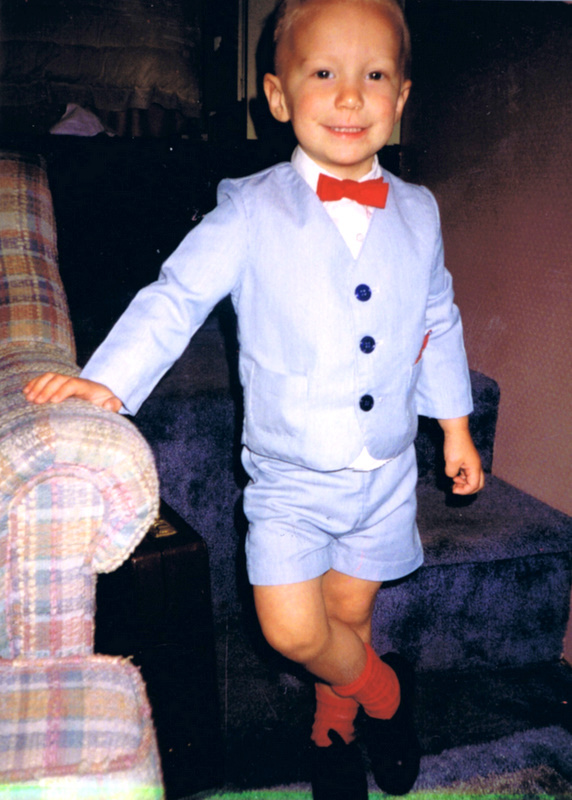 And he was rockin' suits, even way back then. Oh man is he cute, cute, cute. What a little man! Love the red socks! Such a fashion statement! I don't recall seeing Overall Boys before... just the Sunbonnet Babies... You certainly have a wonderful antique quilt most especially with that wee airplane!